I am in love with this breathtaking cookbook. My daughter Kara and her husband gave it to me for Christmas and I haven’t been able to stop looking through it. I see something I missed each time and want to not only make everything in it, but buy a Wyatt Waters painting. It’s a large book with the title artistically placed along the side! Needless to say, I was touched and thrilled that Kara had the chef and the artist both sign the book, and especially to “re-stock the cellar!” This book is a treasure. Here is chef Robert St. John selecting a beautiful ripe tomato while Wyatt Waters looks on, probably already having a painting in his head for this lovely produce! I love the quote. This cookbook is like no other I have owned. 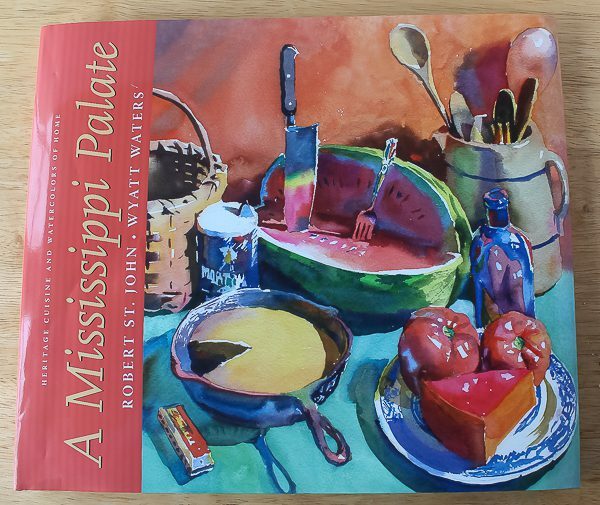 Not that I didn’t have other great cookbooks that combined food and art (but sadly, lost in a flood), but this is one that concentrates on the passion and insight to the culture, life, food, and beauty of Mississippi and its people. 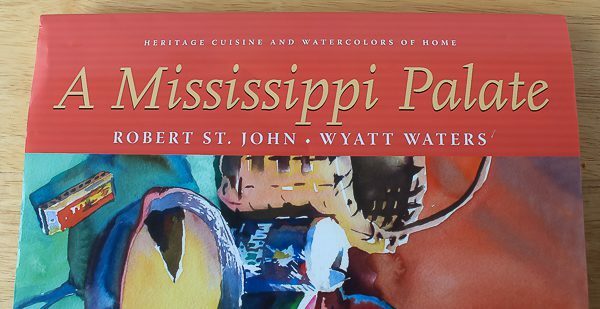 Throughout the book, you will find 105 uniquely Mississippi recipes from Robert St. John, some old, some new, along with incredible watercolors from Wyatt Waters with his intense passion to paint everything Mississippi. The recipe I selected to begin with on my journey of cooking through this book was something called “Comeback Sauce.” If Mississippi had an official condiment, it would be Comeback Sauce. I first tasted the delicious dressing at H.B. Gibbes & Sons restaurant in Learned, Mississippi while visiting Kara and her family. I wrote about our first visit to the very unique Gibbe’s here. The original recipe for the sauce was developed in nearby Jackson in the 1940’s. It’s used as a salad dressing, a condiment for dipping onion rings or french fries, or as a substitute for mayonnaise in recipes like deviled eggs. It’s similar to Thousand Island but spicier and better! I found that the flavor improves if chilled for at least a couple of hours to blend the seasonings. 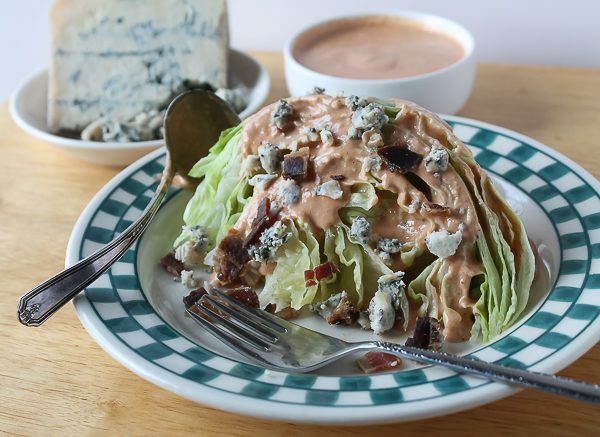 For lunch, I decided to serve the sauce on an iceberg lettuce wedge along with some crumbled blue cheese and crispy bacon pieces. Heavenly! The next day I made some crispy baked potato wedges for dinner to have along side T-Bone steaks. We dipped the potatoes into the sauce and it was so incredibly good. It’s hard to even begin to tell you about all the other recipes in the book. Here a just a few to get your taste buds tingling: In the Breakfast section is “Muz’s Pancakes, The World’s Best.” How could I not try those? (Muz is the chef’s grandmother). There are several breakfast casseroles, Bananas Foster French Toast, Cinnamon Rolls, Praline Bacon, and several kinds of grits. In Soups, Salads, and Dressings you will find Delta Gumbo, Roasted Tomato Soup with Crabmeat and Bacon, Potato Salad, and several other dressings besides the Comeback Sauce. For Lunch, how about some Duck and Deer Sausage Jambalaya, Shrimp Creole, Blackened Shrimp Pie, Creole Catfish, Fried Chicken, or BBQ Shrimp and Grits. A chapter called Before Supper will give you Crabmeat Beignets, Salted Pecans, Mississippi Cheese Straws, Oysters Bienville, and Baked Crabmeat. Supper recipes use a lot of Gulf fish such as Grilled Gulf Fish with Crab Relish, Blackened Gulf Fish with Crawfish Maque Choux, Cajun Enchiladas, Crawfish Mac and Cheese, Braised Short Rib and Grits, Mardi Gras Pasta, and Pasta Jambalaya. Vegetables include Creamed Spinach, Turnip Greens, Fried Corn, Corn Souffle, Sweet Potato Casserole, and Supper Green Beans. In what you would expect in the Breads section is Mississippi Biscuits (made with buttermilk), Dinner Rolls (where lots of frozen butter is shredded and mixed in with the flour), Cornbread, and Hushpuppies. The first item I want to try in the Dessert section is Muz’s Fudge Cake. The chef says he never visited his grandmother when she didn’t have squares of these in a round tin can sitting on her kitchen counter. There is also Banana Pudding, Strawberry Pie, and Blueberry Cheesecake. Anyone hungry yet? 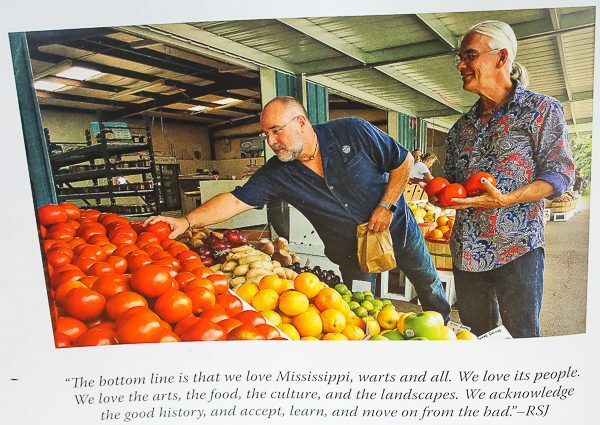 Besides giving me the cookbook for Christmas, Kara also gave us something else uniquely Mississippi. 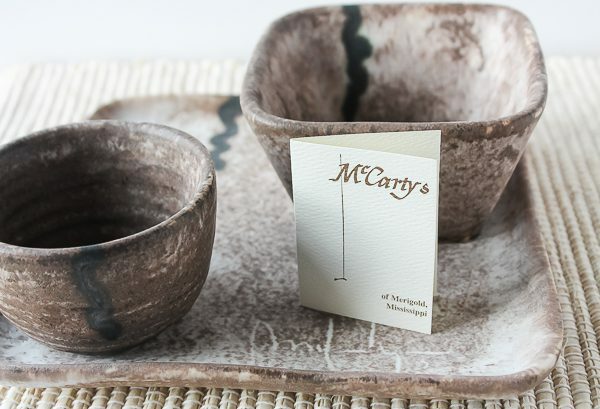 In the town of Merigold you will find McCarty’s and their amazing pottery. The trademark of their art has a little black squiggle down each piece which represents the Mississippi River. These are my first McCarty pieces and definitely not my last. There is a two-year waiting list if you want complete sets of dinner plates and other large dishes! 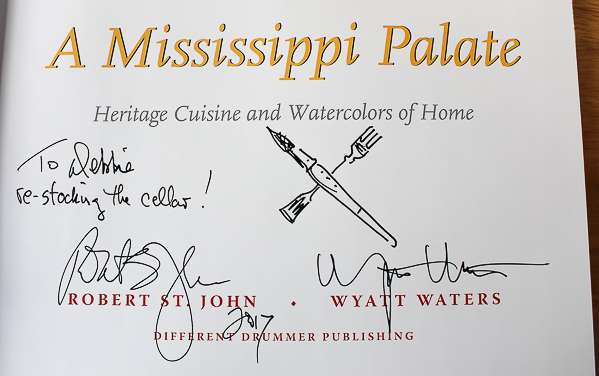 They are all perfect to grace the recipes of the cookbook, giving you a real Mississippi experience for the taste buds and the eye. All you would then need is a Wyatt Waters painting hanging on the wall next to your table. I hope I have convinced you to buy this amazing cookbook. In the meantime, make some Comeback Sauce and enjoy the experience of having a Mississippi palate. Combine all ingredients in a food processor and mix well. Cover and keep refrigerated. Makes 1 quart. Recipe can be divided in half. Delicious as a salad dressing, for dipping with onion rings or french fries, or used in making deviled eggs. Lisa, I will certainly do that! This is on my list of books to add to my collection. I learned about it from a friend who lives in Pass Christian. She organizes readings and book signings at a store there, and hosted the author and artist at an event there in November. Small world, isn’t it? Madonna, our paths continue to cross in the most wonderful ways! You will love the book. 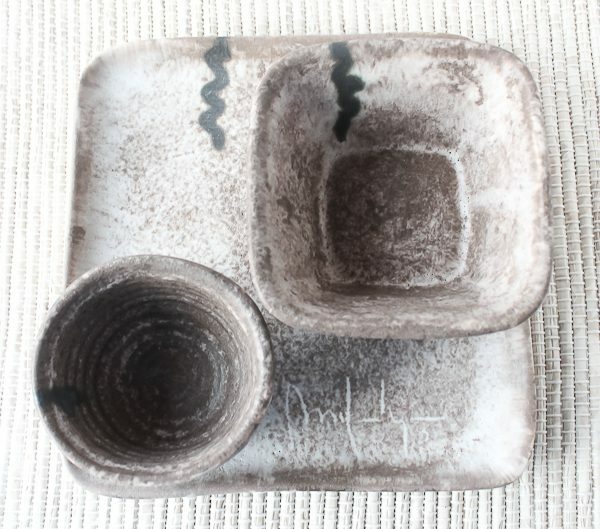 Looks delicious and that pottery is beautiful. What a fantastic gift. Happy New Year ! Thank you for the recent post!